This uses St Tola original Irish artisan goats cheese, just yummy! Break up the chocolate into a heatproof bowl and add the cold water and sugar. Place the bowl over a pan of gently simmering water and stir until smooth. Remove from the heat and allow to cool, stirring occasionally, until tepid. In a separate bowl beat the cheese, lemon zest and vodka to taste, then fold the chocolate through this mixture. Place two or three raspberries or chopped pears into the base of six shot glasses or small wine glasses. 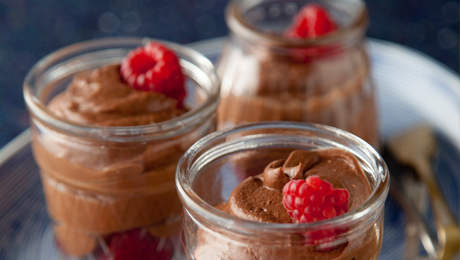 Spoon the mousse on top and chill lightly for 2 hours before serving.